Sunday October 7th, 12pm-4pm, Resurrection Ranch, 65 Rance Road Oswego, IL. 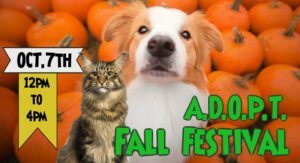 Please join us at the A.D.O.P.T. Fall Festival! Entry: $15 per person, children 2 and under are free. Bring the whole family! Attendees will enjoy a variety of activities at a picturesque working horse ranch. The event will take place rain or shine! We hope to see you there! Free on-site parking will be available. The grounds are primarily grass and gravel, please plan accordingly. Attendees are asked not to pet or approach horses on the farm. Dogs are not allowed as to not disrupt the horses.